An electrifying half-hour from the Korean electronic artist. CIFIKA is a cool-as-hell artist making electronic music that's just really, really good, and often layered with her soft, celestial vocals. Wildly enough, she only began making music a couple of years ago, coinciding with Seoul's burgeoning electronic scene — maybe that's why her work, on EPs such as this year's PRISM, sounds so fresh. 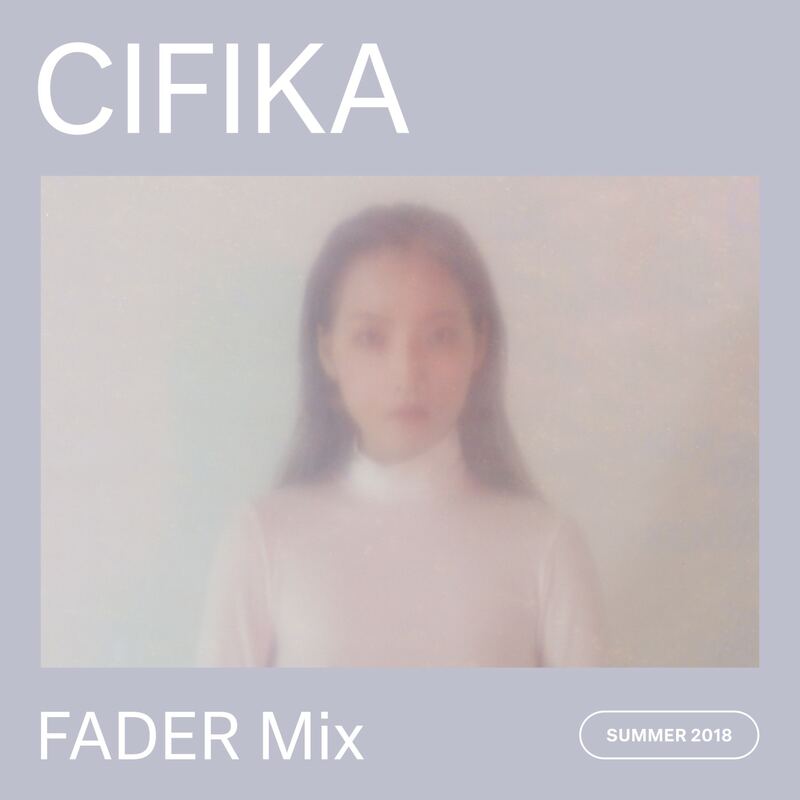 On her FADER Mix, CIFIKA delivers a grab-bag of electronic music that is at once soothing and invigorating, like a walk through a really dense forest. It's "something that [you] can drive to, yo think about something on deeper level." Hit play below, and read on for more about CIFIKA. We are all different individuals, with different culture, different experience. I can’t really describe it in one picture what people would do while listening. Some people might just play this while in bed, some might just listen to it while doing their homework. But I would definitely imagine everyone to do something productive — planning their next painting series, thinking back to their experience with nature. I don’t expect them to dance hard party hard, I’m not that kind of person in the first place. Something that [you] can drive to, to think about something on deeper level. That’s what I mostly do when I listen to other musicians' mix sets. I’m currently digging the new album by Oneohtrix Point Never, Age Of. I listen to Forest Swords, Bicep, Nils Frahm, Jon Hopkins, Dauwd, Jóhann Jóhannson Four Tet and may more. Four Tet’s remix of Opal by Bicep really inspired me, I wrote bunch of lyrics while listening to it. Both Four Tet and Bicep’s music tells a story that no one can really talk about. Something spiritual and very human at the same time. Four Tet’s music can sound very futuristic and sensory, but if I listen to it more than a few times, it feels like nature and human. Something that is more substantial than any kind of music. How did you get into making music? How would you describe Korea's electronic music scene? I literally started making music just two years ago with a set of monitors and Ableton. I was working as an art director at an advertising agency in L.A. three years ago, and moved back to Korea to pursue my will to be a musician. Getting in to Korean music scene was very fun. It was my first time to be surrounded by Korean producers. Because of the size and culture of Korean music industry — the biggest genre in Korean music industry is K-pop, as you know — there are not too many electronic musicians who are active, who can make a living out of being electronic musician. In fact it’s growing and becoming solid together. Many Techno clubs are emerging around Seoul, many DJs play electronic music on their peak time. Various electronic music crew and labels are collaborating and communicating each other through music, and I’m stoked to be a part of them. Korea is small country compared to the U.S. Because of that nature, it seems like everyone knows everyone, everyone is influenced by everyone’s music. I want to help the electronic music scene to become bigger and friendlier to Korean audiences. Earlier this year, you went on a month-long tour across the U.S. What was that experience like? What did you learn? During five weeks of touring with 7-8 people, I learned so much so that I almost felt like I have become a different person after the tour. I learned how to have a humble manner as a musician, how to deal with unexpected obstacles, how to share emotions with other tour staff who were there for me all the time. I'm always by myself, sitting in my studio working by myself, talking by myself, singing by myself. But on tour, I had to be with people, I had to talk to people all the time before and after the performance. I realized how many people put effort to make this tour happen, and decided to have more responsibility and conviction as an artist. New venue, new cities every day inspired me to write new music. I would love to go on a tour again when my new album is out. It was like a life journey for me. Four Tet, "Evening Side (Oneohtrix Point Never edit)"
Adam Port, "I Never Wear Black (Simple Symmetry Remix)"
Jumping Back Slash, "Slow Oceans"